There will be a wedding shower honoring Jessica Germany, bride-elect of Billy Stacy, Sunday, February 3, from 1:30-2:30 in the family room. Jessica and Billy are registered at Bed, Bath and Beyond and Walmart. They are planning a March 2 wedding. 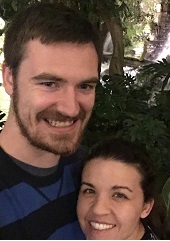 Jessica and Billy met at a singles retreat in November 2017 and have been together ever since. Jessica is the daughter of Jerry & Barbara Germany and is an Occupational Therapist at Pediactrics Plus in Sherwood. Billy is the son of Jesse and LInda Stacy. He has a fine arts degree from Arkansas Tech and is seeking full time employment. Hostesses are Debbie Barker, Karen Ferren, Ginny Howell, Carol Oldridge, Christy Sherrill, Julie Watson, Carolyn Whiteside and Jackie Williams.